It is an honor to be asked to be a godparent. But choosing a godparent is not merely a way to honor a friend or relative after the birth of a child; it is an invitation to take on a big responsibility in the child’s life. No, you are not expected to raise the child in the event of the parents' early demise. That is taken care of by their will. The role of the godparents is more on the spiritual side. As my nine-year-old daughter put it, "The parents help the whole child grow up and the godparents help the child's soul grow up." The Catechism of the Catholic Church reminds us that “Baptism is the sacrament of faith. But faith needs the community of believers. It is only within the faith of the Church that each of the faithful can believe.” (CCC 1253) The godmother and godfather will ideally be fixed points in the spiritual life of the child. They are a small, chosen church community for that particular child, regardless of changes of parish and location. They hold the great responsibility of assisting the parents to help the child to grow spiritually. So, if you have been honored by an invitation to be a godparent, you’ll want to take your responsibility seriously and be faithful to the promises you made when that baby was baptized. Here are a few practical ways you can ensure you assist in the spiritual growth of that child and represent the Church community to him or her, whether you live close by or not. If you aren't already in the practice of daily prayer, this would be a good time to start! A routine time will make it easier to remember and be consistent. Perhaps first thing in the morning (by which I mean, after you've had your coffee!) or before dinner at the end of your grace before meals. When you are at Mass, be sure to remember your godchild when you receive communion. This is a date you really ought to know. Chances are, you were there and dressed up for it. If you don't recall the date, ask the child's parents. They may have to look it up or call the parish where the child was baptized, but this is a date you should celebrate with your godchild. For the godparent, the anniversary of the child's baptism is an even more important date to commemorate than their birthday. Celebrate both, by all means, but if you're going to forget one, let it be the birthday. Some simple things you can do to observe the day would be to have a Mass said for the child's intentions and send a Mass card. A nice letter reminding them of the momentous event that happened that day and encouraging them in living the Faith will go a long way toward building your relationship. At the very least, a phone call can be made. If the child is still too young to care about any of this, his parents will appreciate it. If you're close enough to visit, you could have a little party. Cake and even a gift related to the Faith are a wonderful way to celebrate. If your godchild is no longer a baby, it’s not too late to begin a tradition of remembering them on this special day. They might love to get to know you or it could be a way to help them back to living their baptismal promises if they have strayed. Their baptismal anniversary would be a good time for you to teach your godchild to renew their baptismal vows. Just as we do at Mass on Easter, everyone present renews their baptismal promises at the same time. Here are the questions for you to print out. 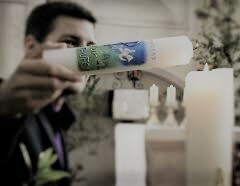 If it hasn't been long since the baptism, the parents may still know where the baptismal candle is. Their baptismal birthday celebration is the time to bring out the candle and light it, ideally when the baptismal vows are being renewed. If you no longer know where the candle is, just order a new one to use for their anniversary celebration. Order one for yourself, while you're at it! Get to know your child's patron saint and help celebrate their name day! You can ask the parents if they were named for a particular saint. A quick Google search will turn up that saint's feast day. That is the “Name Day” of all those named for that saint. It's possible that the parents their baby a traditional name, but didn't have a particular saint in mind. Encourage them to choose one that they think will be a good example for their child. If the name is one that is made up or doesn't have a saint associated with it at all, just choose a patron saint who seems appropriate for some reason. Celebrate that saint’s feast as the child's Name Day. Again, having a Mass said for the child is the greatest of gifts. It may seem boring to a child now, but its value is immeasurable! Go ahead and get them a treat or a gift! Have a little celebration for their Name Day. Catholics have so much to celebrate! Now that you know their patron saint, you may find books, statues or holy cards about that saint. Why not surprise your godchild with them sometime? It is another way to stay in touch and build a relationship with them, as well as bolster their faith. If the child is small, here there are some really cute toys and books that will help instill a love for holy things. Be sure your godchild actually knows who you are as they grow up! It is not unusual for parents to choose a godparent for their child who they are close with at one time in their life, but who then become separated by distance. Do stay in touch as you can. Try to cultivate a relationship with the child that outlives the one you have with their parents. Point out the reason for your special relationship with them when you are together or through letters. If you're a close relative, you may always be remembered as Aunt Carol and the godparent/godchild relationship may go by the wayside. Be sure to set yourself apart as a sure companion along their spiritual journey. First reception of the Eucharist is a very special day for most Catholics. Be sure to be there for your godchild to show that you are with them along this journey. But also find out how you might help prepare them for important sacramental firsts. Ask their parents when they will be preparing for their first confession (also an important event, but seldom celebrated with panache), first Holy Communion, and Confirmation and ask how you might aid them. Pick the suggestions that will work for you and your impact as a godparent will be multiplied! If you pick all of them, then your godchild may well become the envy of all his siblings. But, more likely, his parents will adopt some of these beautiful practices into their family observance of their Faith. And all will be richer for it. Labels: baptismal birthday, be a better godparent, godparents. catholic baptism, Name Day, What is a godparent supposed to do? When Someone Falls From Grace, Help Them Up!